The Hypnorama Reflex: Trans-scientific experiments and archetypal spatial constellations are central in the work of Nikolaus Gansterer. 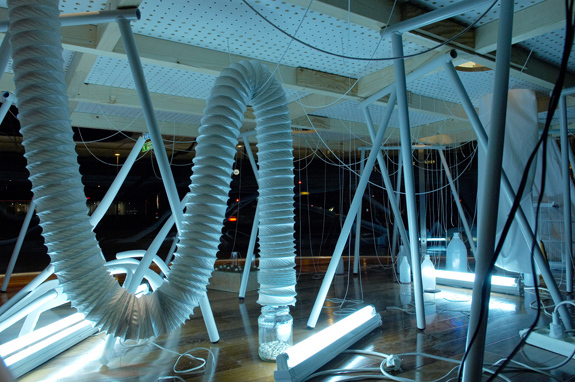 The point of departure for the installation Hypnorama Reflex is Gansterer’s exploration of the development of psychotherapeutic practices and of the significance of hypnotism as an experimental science. Nikolaus Gansterer stages the therapeutic setting as a theater without actors, whose form is in processual transition over the duration of the exhibition. The couch and the therapist’s easy chair, as well as a host of diverse props, are both eye-catchers and conveyers of action. 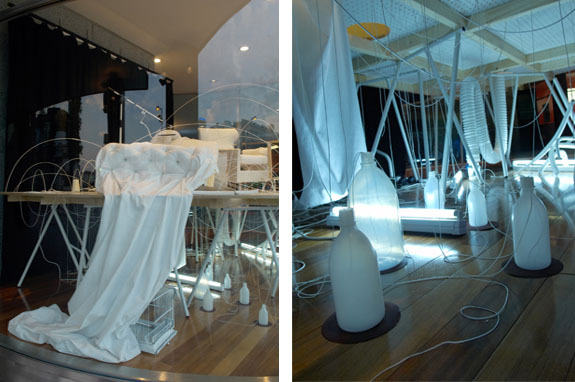 Gansterer has installed both of the pieces of furniture on a perforated display platform in a glass pavilion. During the exhibition, Hypnorama Reflex develops into a multi-layered space of action, making hidden relationships visible. On location, Gansterer is working on a visualization of cognitive models using analytic visual and aural constructions. In his associative approach, Gansterer queries social levels of meaning, commenting on the background against which early forms of psychoanalysis developed and on the role of Vienna in this process. Thus he transforms the round display window into an inverse diorama. An audio track developed in collaboration with Stefan Geissler brings the fictive actors to the stage. Here their memories and feelings mingle with the electronically processed sounds of Jew’s harp, tuning fork and suggestive whispering, giving rise to an ethereal rendering of historical treatment seances. Audio track and display stage, performance and video, drawing and text: they all merge in the multiple narrative structure of Hypnorama Reflex. Furniture Lore for the Drowsy. The chair is resting on a prosthesis to keep its seat in balance. Propped up with mangled books that have long since ceased to interest any reader, it stands in the midst of a scene of furniture ruins. Nikolaus Gansterer has diverted two pieces of Wittmann furniture from the production process and combined them in a setting that is easily recognizable as that of a psychoanalyst’s consulting room. 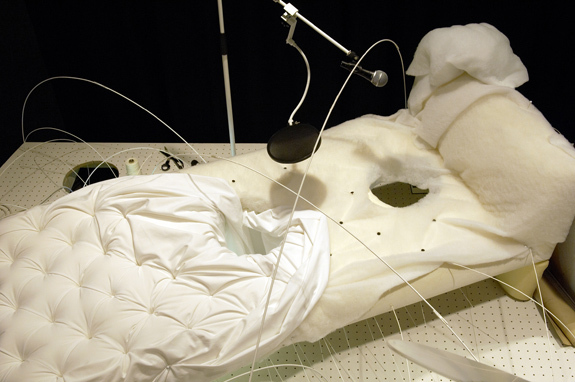 A couch suitable for reclining is pushed together with an upholstered chair at its head, thus forming an insignia for research into unconscious processes. Since Freud, psychoanalysis has operated under a furnishing guideline, simple and iconic as that of hardly any other science, in which it unfolds its research and its curative effect. Through a combination of two pieces of furniture that can be realized in any living room, an unconventional perceptual situation is created, in which the gaze and the voice are disjoined and put together anew. This setting profits from the communicative functions accorded to the furnishings and their arrangement. The showroom of the furniture store behind outlines the communicational situation usually established by the placement of chairs and sofas in public and private living spaces: sofas, with chairs arranged around them, set the scene for a relaxed conversation with multiple vis-à-vis or are oriented toward a television set. The repositioning of couch and chair undertaken by the psychoanalyst’s office robs not only the speaker, but also the hearer, of the reassuring eye-to-eye contact that usually keeps a conversation in progress and in balance. Without visual contact, which can have a calming, confirming, correcting and controlling effect, the reclining analysand speaks to an invisible and also inaudible analyst. 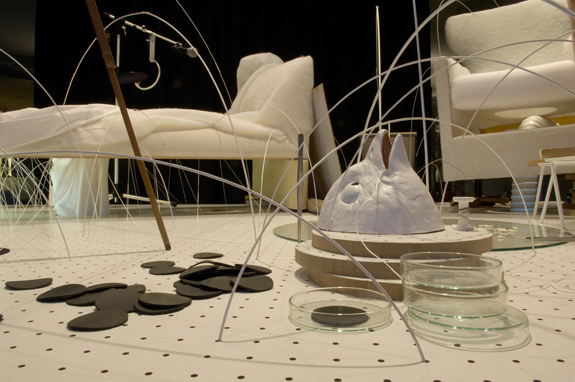 The interior presented by Gansterer on a perforated stage in the display window of a furniture store is not content with merely borrowing the established furnishing conventions of a psychological discipline. 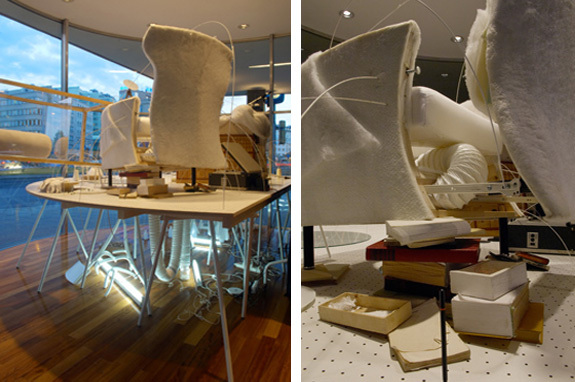 The installation presents the cadavers of furniture that has been eviscerated, pierced and skinned on a stage that gives rise to the impression of the cluttered storeroom of a psychological research institute. Attempts to locate the scene in time are just as futile as those aiming to determine the exact nature of the therapeutic practices suggested by the objects. This junk room of science needs neither test subjects nor the scientists who might have thrown away its objects. The furnishings themselves, accoutered with corporeal attributes of their own, enter into communication with one another. 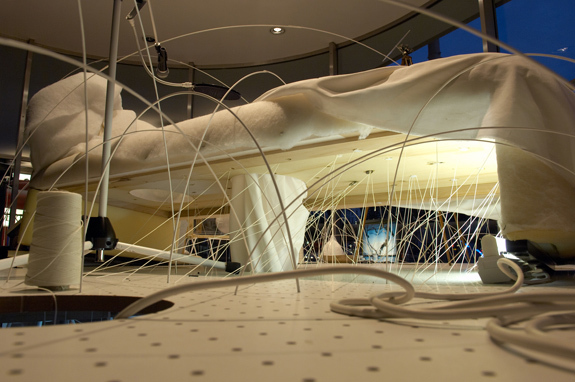 In the dilapidated cushions, which lend an organic quality to the chair and couch, a system of pipes leading into the stage’s underground has been installed. 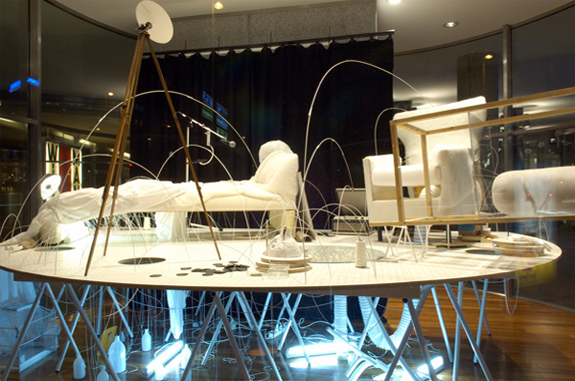 The analyst’s chair communicates with the sofa as a commode via a sewer system linking the two pieces of furniture. A novel by the Dutch author Leon de Winter begins with the description of a psychoanalytic couch, which the protagonist, who is suffering under a shortage of success in life, believes is connected through a hole in the upholstery directly with the Amsterdam sewer. The dual function of the couch, which serves simultaneously as a therapeutic instrument and a toilet, makes it into a vehicle of self-searching that is at times uncanny, at times ironic, whereby it is associated with thoughts of decaying cadavers and abominable stench. In Gansterer’s sewer system, all such disgusting lines of thinking empty into a jar with white beans. The outrageousness of these visions, and the disparateness of the affect-laden imaginations by which they are fed, become clear in the bean jar. Excretion, as a body function, corresponds with an activity that is one of the fundamental practices of science: classification. The beans appear a second time, in a video on view in the Wittmann Lounge at the MUMOK: there black and white beans are being sorted by two hands according to color. In its title, Gansterer’s work puts sleep in a viewing apparatus that borrows from the panoramas of the nineteenth century. 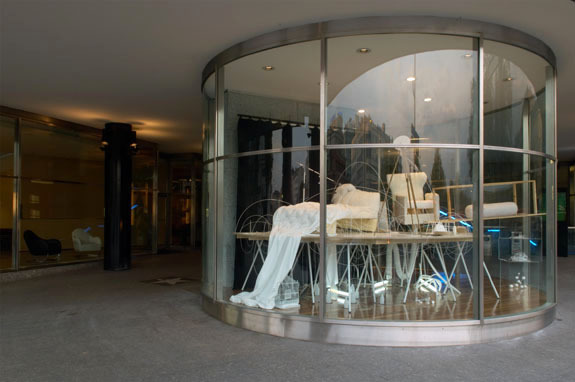 Gansterer translates the nearly circular form of the display window in front of the Wittmann showroom into a situation plan for a stage panorama. Instead of offering a panoramic vista from a well situated central point, he puts an uncomfortable sleeping chamber under observation at one of Vienna’s most heavily trafficked intersections. When Roger Bastide began an investigation of the social significance of dreams in Brazil during the 1960s, he discovered that his colleagues from the field of sociology handled sleepers as if they were dead. Snubbed by the asocial retreat from the world taken by the sleeper, the sociologist simply denied his existence. For sleep and dream researchers, on the other hand, consciousness never sleeps entirely. Through techniques of self-observation and for observing others, the processes in operation in the state of sleep are registered. According to Freud, the power of censorship exerted by consciousness in a waking state is decreased in sleep. This also explains his affinity for the couch. The reclined position points toward the dream and the loss of control, but also toward a childlike dependence. Beholders of Hypnorama Reflex are not granted an overview or the wide vista of a panorama. Their point of view is not above, rather below the stage, where the sewers and intravenous lines come together. The street and the adjacent building are transformed into an acoustic space that functions as a psychotechnological monitoring room. Headphones provide a prehistory of psychotherapy, in which the visions of hypnosis patients flare up between music sequences, composed in collaboration with Stefan Geissler, featuring the electronically processed sounds of the Jew’s harp and tuning fork, both instruments used by hypnotists to induce states bordering on sleep. Hypnosis fell out of favor in science, not on account of any deficiency in its efficacy, but because its effects were unpredictable, and because it was a practice that was difficult to distance from charlatans and popular amusements. In his work, Gansterer has on a number of occasions treated the research styles of scientists as aesthetic practices. 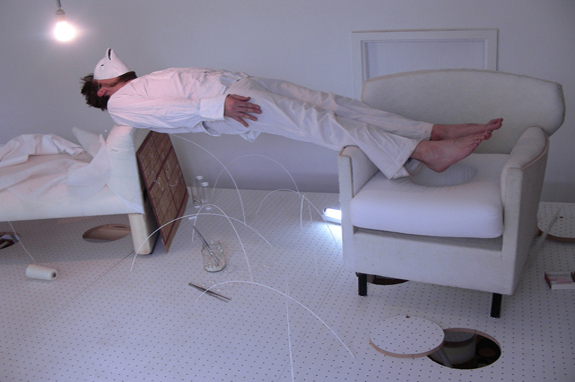 In this cross between a carnival booth and an experimental setup cobbled together from the storerooms of psychological research, he whimsically and lucidly traces the exploration of the worlds of sleep nestled in the folds of a piece of upholstered furniture.